Vijay Gupta: Academically he is an electronics engineer. 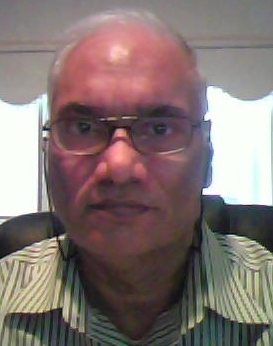 Professionally he is an IT consultant working in the ERP area of Information Technology Solutions. He lives in Toronto, Canada. Currently he is not associated with any institute of learning or research. He will like to be associated with an institution in the area of Theoretical Physics. Theoretical Physics and Philosophy of Science has been his passion since 1965. Understanding Conservation of Energy was a challenge to him. The introduction of concept like potential energy appeared to him as engineered concept to apply conservation to energy. In 1968 he proposed to his friend the need of rethink process in Physics. He proposed the name Pico-Physics to the new basis for understanding nature, as it may emerge after the re-think process is applied. As he got introduced further to topics of science in his pursuit of Bachelor of Engineering, he was able to integrate them into his thought processes. In 45 years, his rethink processes has resulted in formulation of Refraction as a Unary Interaction. All changes (dynamics in universe) can be understood in terms of Refraction. Refraction itself gets explained by Unary Law ‘Space Contains Knergy’. In Unary Law each word has special significance. Knergy contains the concept of Konservation – Conservation without Neutralization. Space represents Anti-Konservation. Contain represents mapping of Konserved reality into Anti-Konserved reality. Both Space and Knergy are real entities. PicoPhysics basis its thought processes exclusively on Unary Law. Thus simple facts like 3-Dimensions of space, Time, Inertia, Force, Mass, Charge etc have to be explained and integrated into Unary Law. For this Unary Law explains creation of particles out of Knergy existing in Space. The properties of these particles are then evolved to identify with individual particles conceptualized in contemporary physics. He seeks to present PicoPhysics thought-process to community of people devoted to understanding Natural Phenomenon. The presentation starts with detailing different steps in observation. Bring out human element in the observation highlighting Intuition, Speculation and Abstraction. A rethink on mathematics set theory with reworking the mathematical concept of Zero and Infinity. Select an Interaction Model(between Knergy and Space) from available options. Build logic between Unary law and Unary Interaction (Refraction). Use Refraction as primary reason of confinement of Knergy in space. The space confined Knergy is identified with matter. From these foundations begins the main unfinished task of integrating the advanced contemporary experimental data with PicoPhysics. This entry was posted in PicoPhysics Concepts and tagged Conservation, Energy, Formation of Particles, Infinite maths, Mathematics, Origin of Universe, Quantum, Relativity, Set theory, Space, Theoritical Physics, Universal theory by vmguptaphy. Bookmark the permalink.